THE MAGAZINE BEHIND NZ'S EXPORT DRIVE GOING GLOBAL? GO MOBILE! ★ BABICH: LIVING A WORLDWIDE LEGACY ★ SIX MONTHS IN SHANGHAI ISSUE 42 WINTER 2016 THEY'RE WEARING OUR SOCKS OVER THERE NZ SOCK CO'S INSPIRING EXPORT STORY. PAGE 6 MONEY MATTERS OUR GUIDE TO EXPORT FINANCE. PAGE 16 SCALING UP CHINA THROUGH COLLABORATION ROD MACKENZIE'S BEHIND THE SCENES INSIGHT. 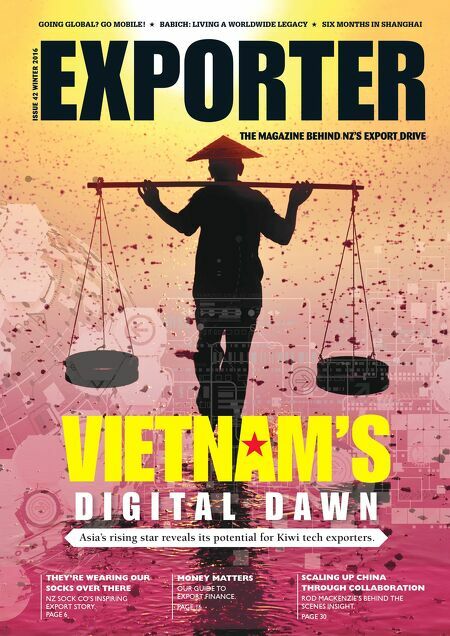 PAGE 30 D I G I T A L D A W N Asia's rising star reveals its potential for Kiwi tech exporters.